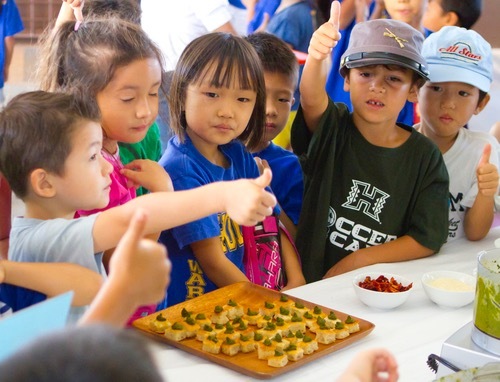 As part of Green Tables and Food Day the LDEI Hawaii Chapter partnered with Liholiho Elementary School for their Food Day and Fitness Fair on Friday, October 19. More than 400 students experienced movement activities in the school’s open field directed by their volunteer physical education teachers. 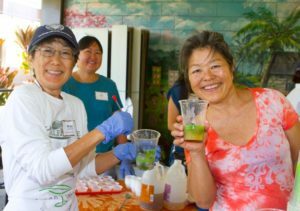 Hawaii Dames showcased various tasting stations around the campus on how to prepare and cook vegetables using local agriculture produce. 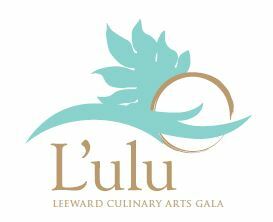 The educational tasting stations included: Green Smoothies, Paint your Lettuce & Tomatoes, Getting Creative with Herbs & Greens, and a Live Cooking Demo with Chef Kevin Hanney of 12th Avenue Grill and SALT. 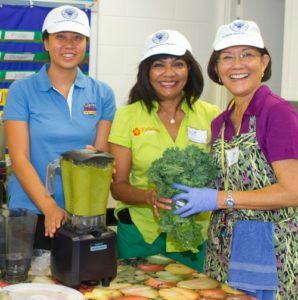 The goals were to introduce students to a variety of vegetables and to teach parents various ways of preparing them. Dame Jill Nordby’s CSA truck, Holoholo General Store, was on hand for students to walk through and see the various produce. Recipes are being provided for a cookbook to be sold by the school. Hawaii Dames Possie Badham, Dorothy Colby, Kai Cowell, Holly Hadsell El-Hajji, Soleil Fusha, Beth Iwata, Jenny Johnson, Kathi Saks, Angela Terry, Kay Tokunaga, Adrianna Torres-Chong, Shannon Piper, Dianne Vicheinrut, Lori Wong and Jan Yap mobilized donations and volunteers and turned out in force for the big event. 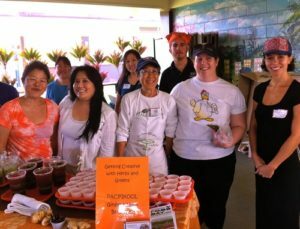 Cheryl To, Soleil Fusha, Kay Tokunaga, Jenny Johnson, and Angela Terry manned two stations serving ginger drinks and pesto and foccacia. 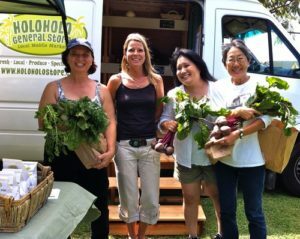 Dames Dorothy Colby, Soleil Fusha and Kay Tokunaga (holding vegetables) with Dame Jill Nordby and her Holoholo General Store CSA truck.